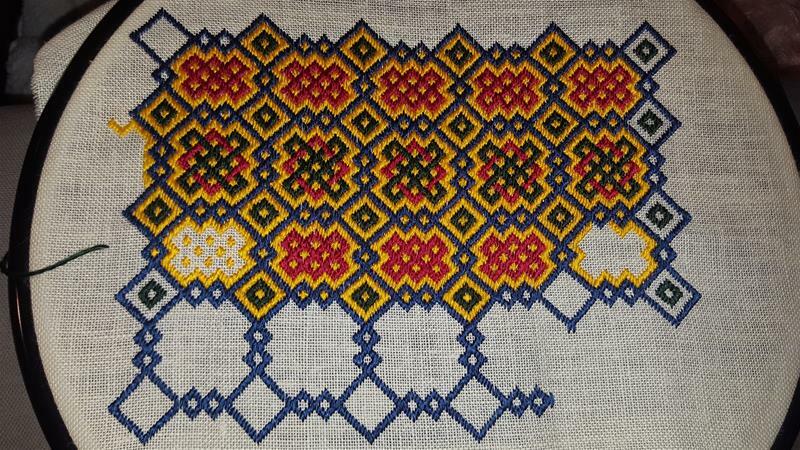 Last weekend i attended a course by Historical textiles in Stockholm. They finished an amazing project last year (read more about it here) and now they are offering their knowledge in what they learned during the process. As a New Year’s resolution I promised myself to both attend and give courses this year, so this was a good start. This course was well prepared, and we got to learn a lot of history of these kind of work. 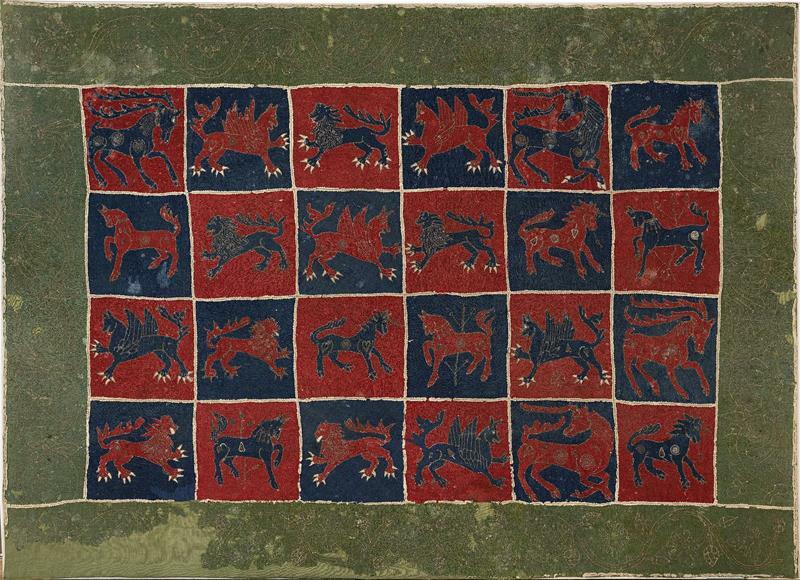 And also se a lot of pictures of embroided intarsia coverlets and cushions that have survived through the years. 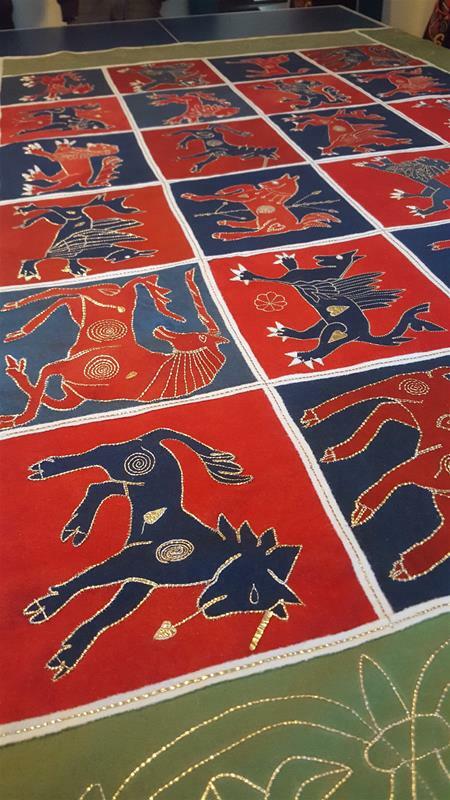 As a final treat, we got to look at the finished coverlets that started this whole thing. I guess that I would have been able to figure the technique out for myself if I really wanted to. But I probably never would have started anything as it is outside my comfort zone. And I probably would have made several mistakes that I didn’t have to do now (some one else already have made those and learned from it and could teach me not to do the same). And – most important. 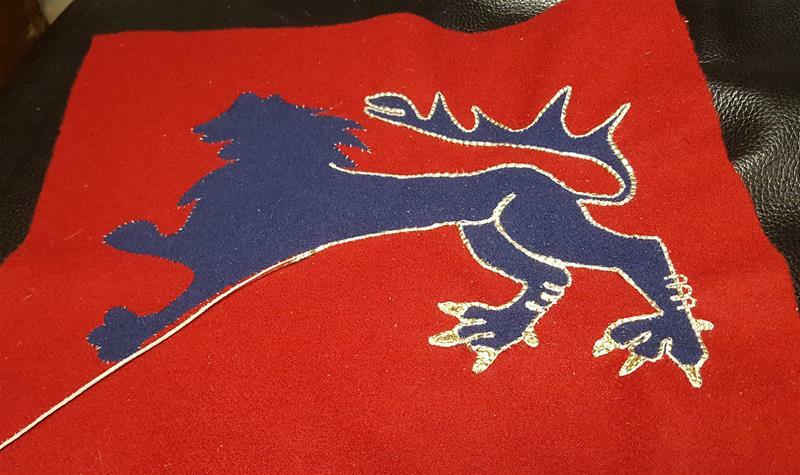 I never would have been able to get my hands on the guilded leather (real goldleaf). I will just post a couple of pictures here. I rather see that you sign up for the course. And yes… they can come to you if you want to you just have to ask. 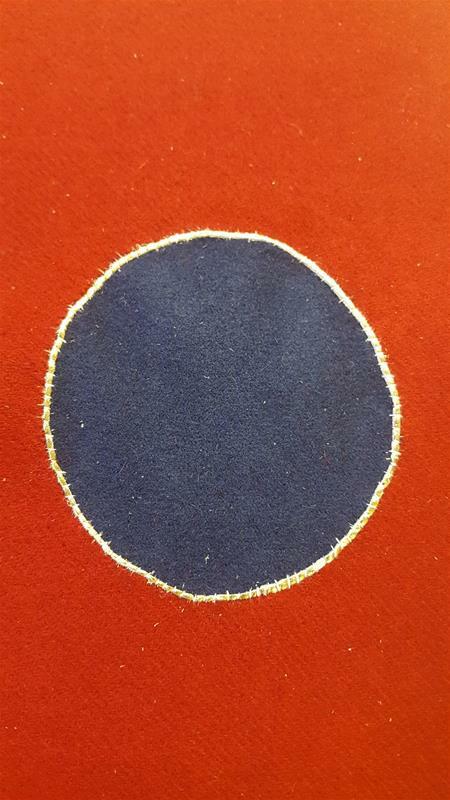 Förra helgen gick jag en kurs i intarsiabroderi i Stockholm för Historical textiles. Dom avslutade ett helt otroligt projekt förra året (läs mer här) och nu erbjuder dom kurser där dom för vidare vad dom lärt sig själva under processen. Jag gav ett nyårslöfte i år, jag ska både gå fler kurser och även ge fler kurser så det här var en bra början. Jag vill verkligen uppmuntra er att göra samma sak. Har ni något ni är duktiga på så erbjud er kunskap till andra, och är ni inte så duktiga så gå kurser för dom som är. Ni kommer inte bara att växa kunskapsmässigt (ja man lär sig saker på att lära ut också) utan även som människor. Ni kommer också att utöka er vänskapskrets. 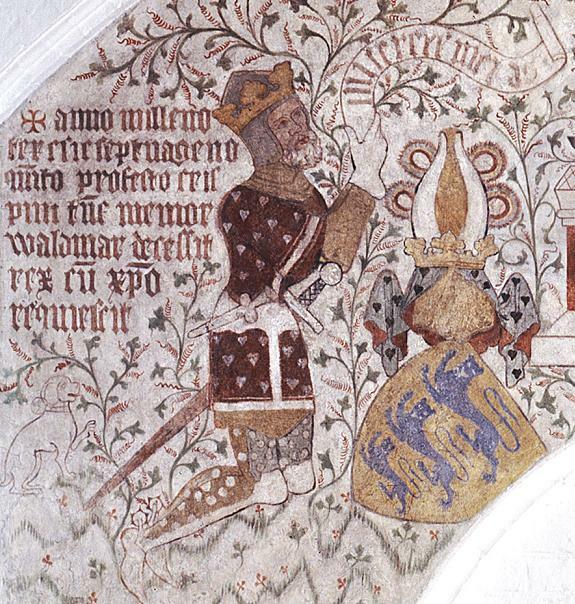 Kursen var väl underbyggd och vi fick se många bra bilder på historiska fynd av liknande textilier, samt lära oss mer om deras historia. Och som en sista liten guldklimp så fick vi även se dom återskapade guldskinnstäckena som startade det hela. 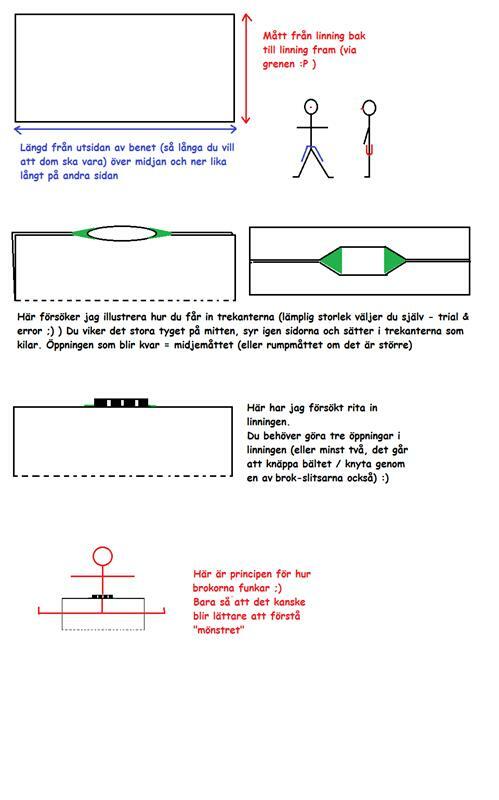 Jag skulle säkert ha kunnat klura ut tekniken själv, men jag skulle nog aldrig kommit mig för att göra det. Dessutom slapp jag ju göra alla nybörjarmisstag själv, någon hade redan gjort dom och kunde berätta om det och visa hur man skulle göra istället. Jag kommer bara posta några få bilder här för inspiration, jag ser hellre att ni går kursen faktiskt. 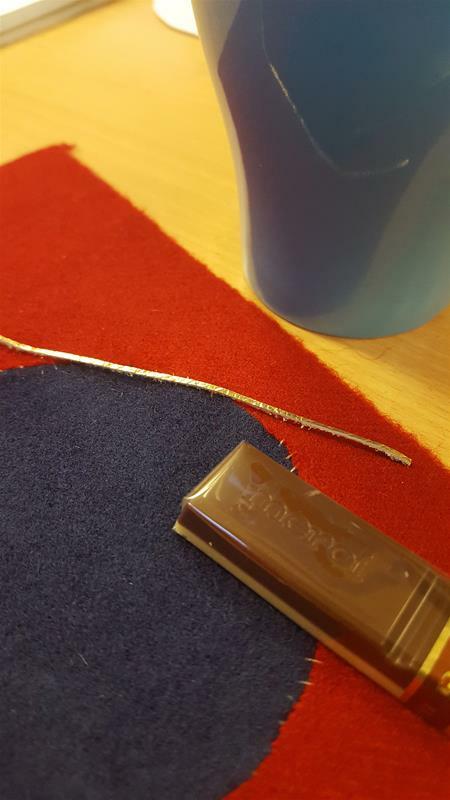 Starting with some Swedish fika and a test embroidery / Fika och provlapp. 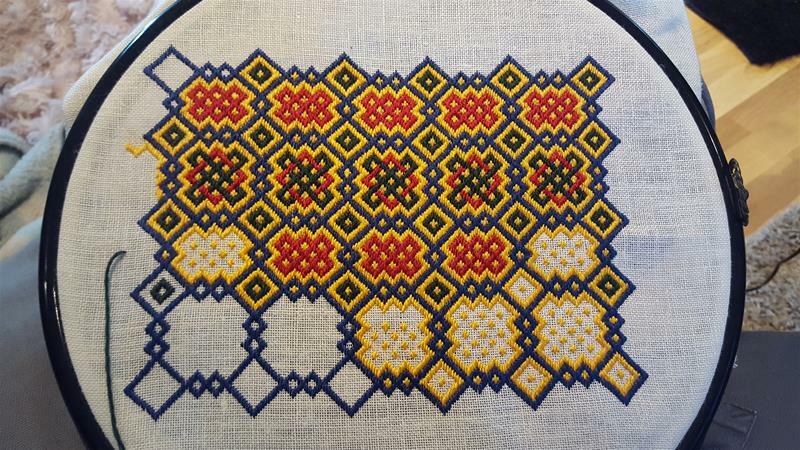 I started a project a while back, where I was inspired by the roof of Hospices de Beaune (in France) and wanted to translate it into a brickstitchpattern. I decided to just donate the bag to Thomas and his whife Maria and let them take care of the auktion since I always underestimate what my stuff is worth. It is not in any way some kind of false modesty. I just believe that the stuff I make isn’t up to everyone elses standard. I don’t know why… I have always thought so. Today Maria put the auktion up in a Facebook-group and I almost dropped my jaw at the startingprice. … and people are bidding! För ett tag sedan startade jag ett projekt med inspiration av taken på det Franska Hospice de Beaune. Det var tänkt att bli ett broderi som skulle sättas fast på en läderväska av modernt snitt som jag också skulle sy. Sen såg jag att Thomas Neijman startade ett crowdfundingprojekt och blev inspirerad av att någon annan donerade en Visbyplata för utauktionering och tänkte att jag kanske kunde göra det här broderiet till en liten påsväska istället. Eftersom jag själv är väldigt dålig på att värdera mitt hantverk och alltid verkar undervärdera det så bestämde jag mig för att helt enkelt ge väskan till Thomas och hans fru Maria och låta dom sköta auktionen. Det är inte falsk blygsamhet som får mig att undervärdera det jag gör. Jag vet att jag undervärderar det, men jag har den där lilla djävulen på axeln som sitter och säger att det jag gör inte är lika bra som alla andras, och därför kan jag inte begära lika mycket betalt som andra gör. En stor del av materialet till det här projektet har jag fått av en anonym givare och därför känns det ännu bättre att få ge det vidare. Some pictures from the process of making the bag / Några bilder från tillverkningsprocessen. A warning if someone wants to use this – I made some misstakes at the edges of the pattern. I forgot that it shouldn’t end there, it should repeat. So think about that. Also, I just made this in paint so not all ”stitches” are the correct hight. 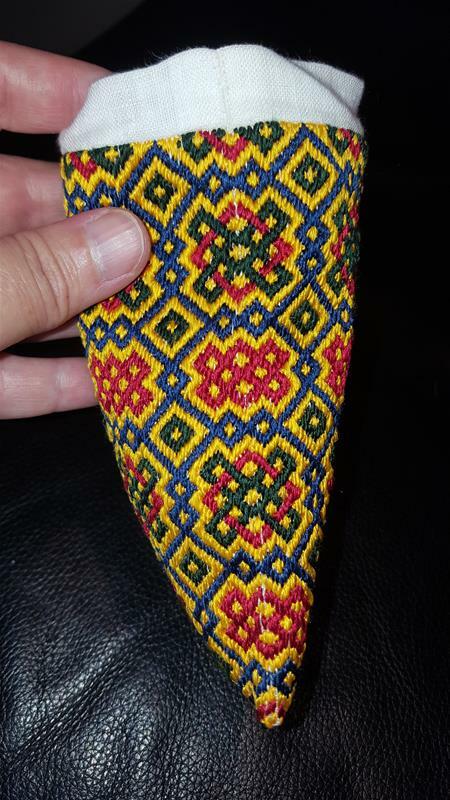 I will not recommend this for beginners, you need to be able to see the faults in the pattern to use it. En varning om någon vill använda mönstret här – Jag gjorde en del misstag i kanterna på mönstret där jag glömde att det skulle upprepa sig. Så tänk på det. Och eftersom jag gjorde detta manuellt i paint så har jag inte fått alla ”stygn” i korrekt längd. 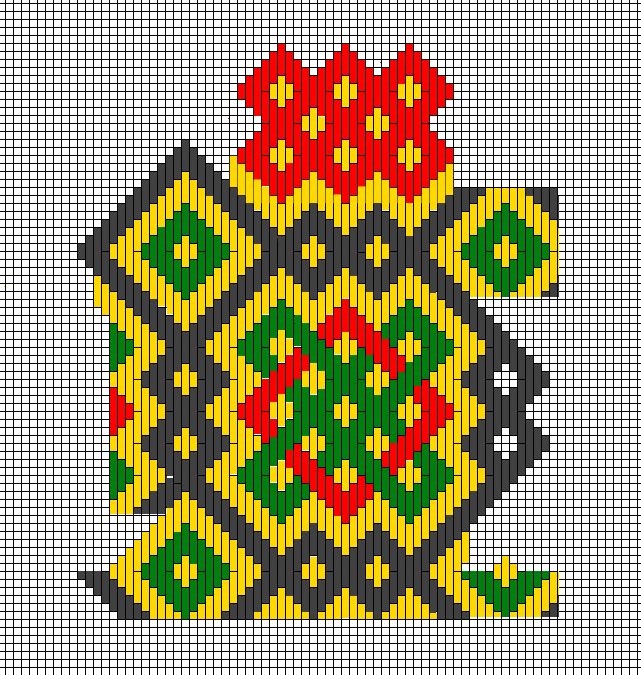 Jag rekommenderar inte att du använder detta om du inte är van vid att brodera brickstitch eftersom du behöver kunna se felen i mönstret för att kunna undvika dom. Not so simple – A fit for a king! This post can be find in Swedish on my facebookpage with the same name as this blog. 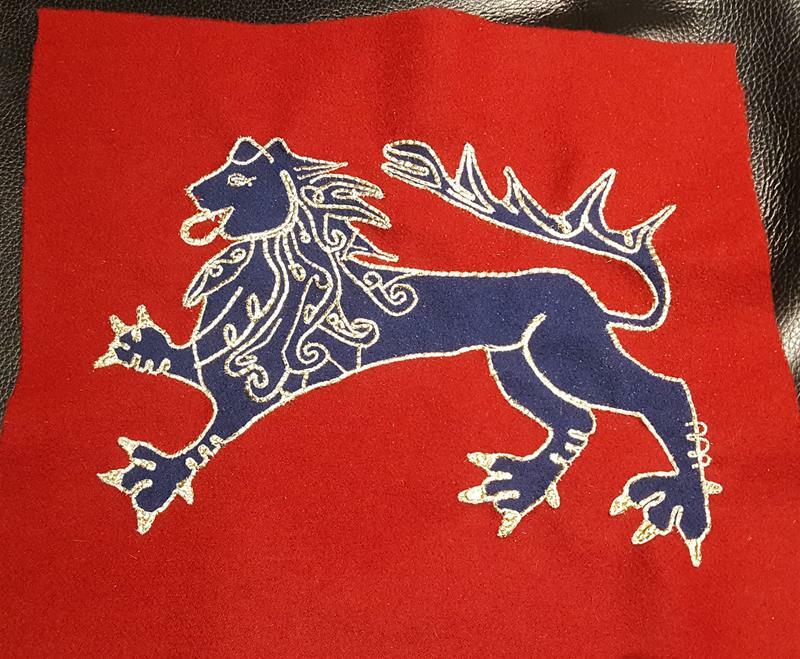 About a year ago, or thereabout, I volountered to help with some sewing for the event Battle of Wisby (6-14 of august this year). Instead I got the question… Can you sew this? My stomach filled with butterflies. 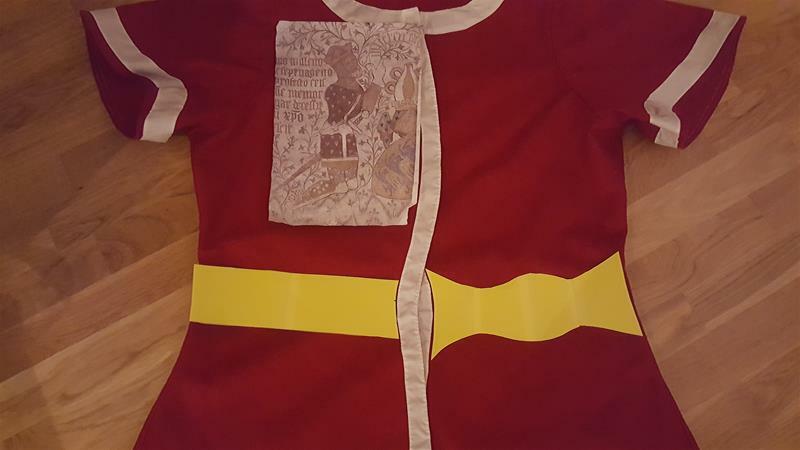 I said that well, no problem, could you cut the pieces out and I just did the sewing since I didn’t have anyone to do a pattern on. But no, the person wearing this weren’t even in the same country as us. Very, very specific measurements, and a lot of them. But then I didn’t hear anything for quite some time. In the meantime I got another request for the same event. A participant that couldn’t sew wanted an outfit. So I helped her with that and thought that that was it. Perhaps they found someone more qualifyid to make this outfit? About 2,5 months before the event I got pictures of the pattern being made. There was no time for them, and when I was told who they were my heart just dropped. Should I (a nobody from Sweden) make an outfit for Bertus Brokamp, Isis Sturtewagens other half… I couldn’t… could I? were it going to be to their standard? OMG… My stommache tied itself in a knot. 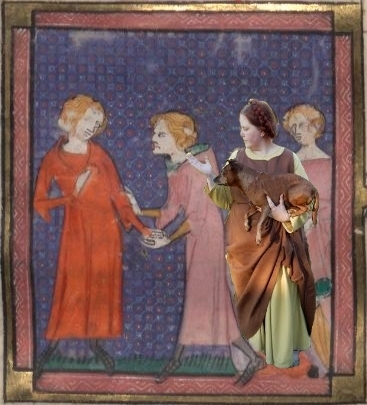 But Maria Neijman who gave me the assignment assured me that it would be fine. 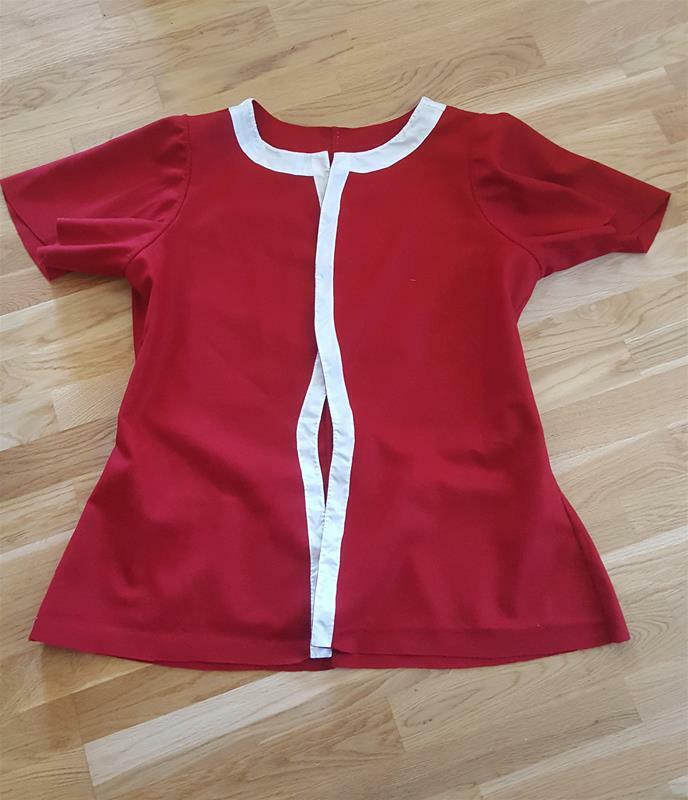 Due to the postalservice who lost – and then found the package it would take until about 3 weeks before the event until I got the fabric and pattern. And then I was a nervous wreck, but I tried not to show it. Maria added me to a facebook conversation with Bertus, Thomas Neijman and Johan Käll and we really did some discussing about how to interpret the picture from the church. We wanted to get as close as possible. 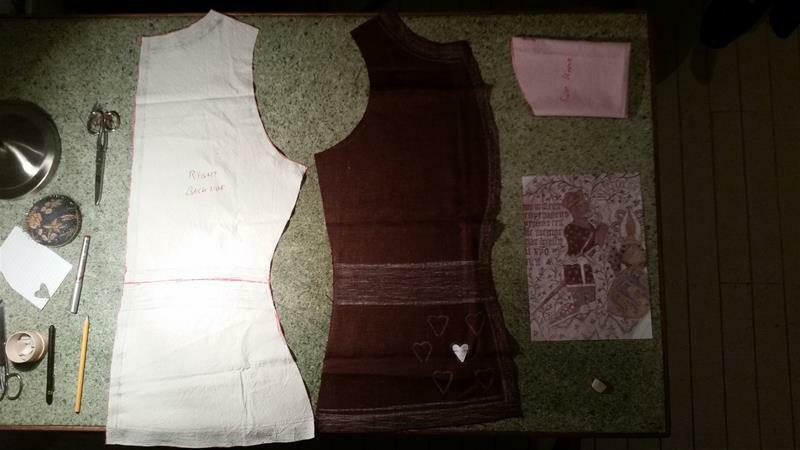 I worked as fast as I could, the day the fabric and pattern arrived i cut it out and sew most of it togeather. 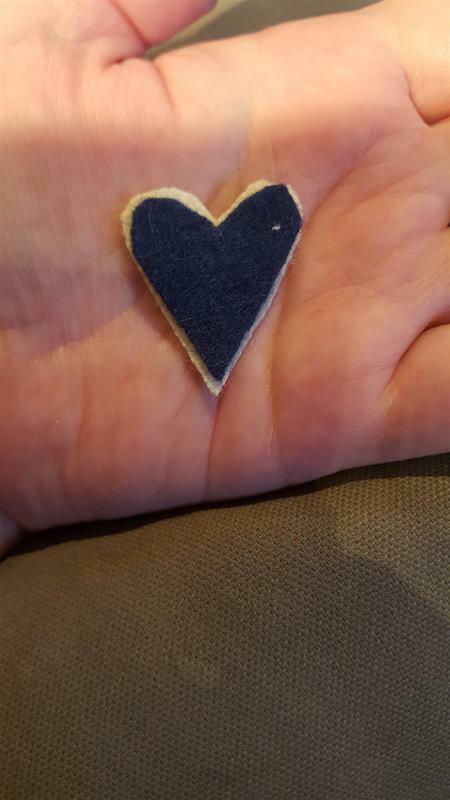 I also posted a picture of the white hearts I where cutting out for the appliques, and the conversation went quiet for a minute or so. – Ehm… white hearts? They should be blue, shouldn´t they? – Blue? I thought they where green? 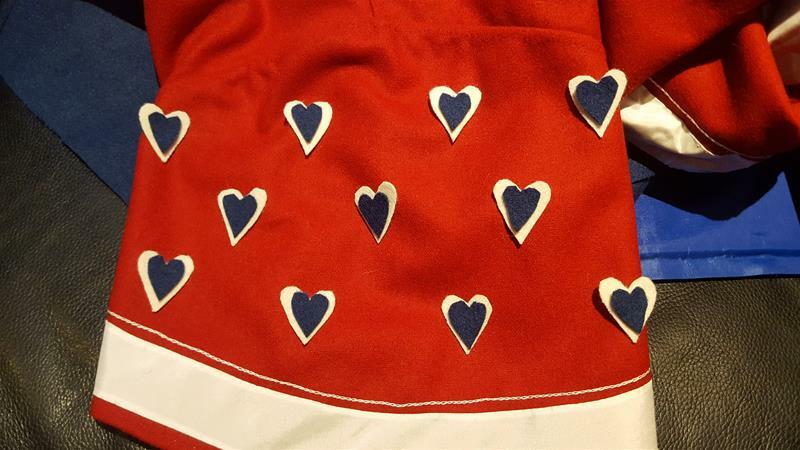 We all agreed that it should be a white trim, so I could keep the hearts I already cut out, but I had to do the same amount but smaller i a blue fabric that Maria threw in the mail. In the meantime we talked about the helmetcover wich I hadn’t realised that I should make until i saw the patterns. 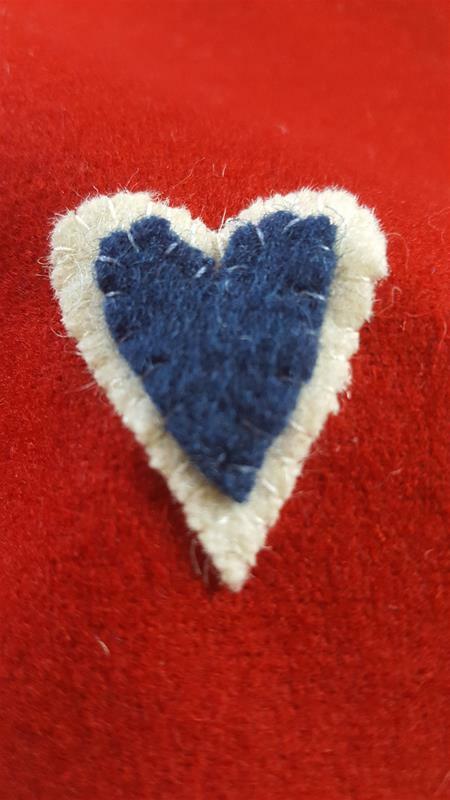 We opted for the colours that I already had, even though perhaps it should have been a light blue or grey fabric instead for the darker blue, and blue hearts instead of the red, but it still was Valdemar Atterdags colours. And we didn’t have any time to go fabricshopping or dye some fabric. 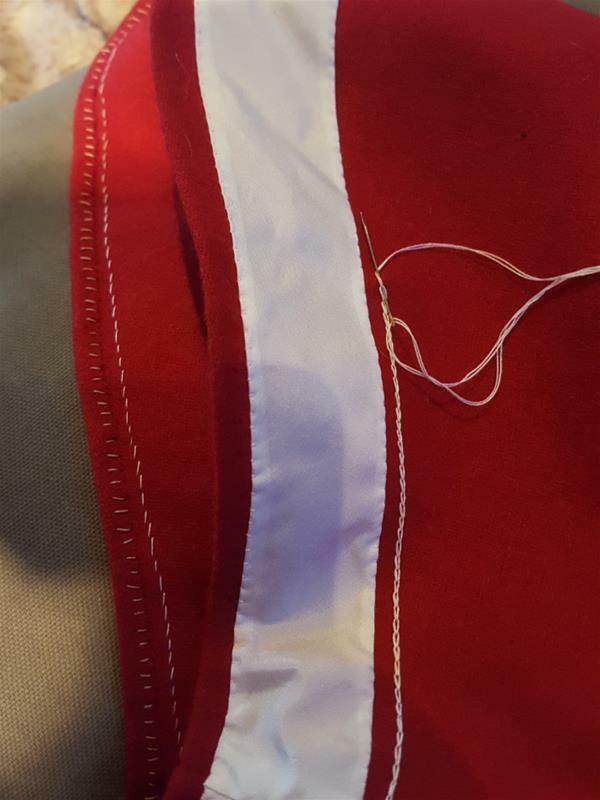 By now I were sewing about 10 hours a day and I still have a hard dimple in my right hands middlefinger after pushing the needle trough the fabric. 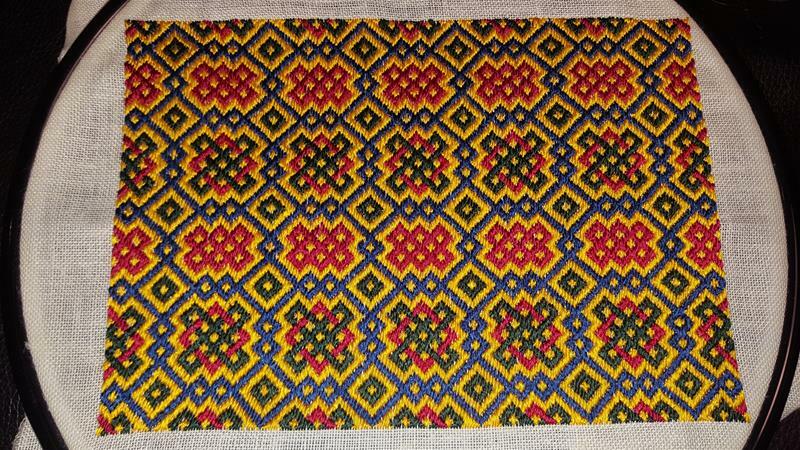 Late evening the day before we started our journey to Gotland and the event, I put the last stitch in. The only thing I didn’t manage to make in time was the band for lacing the jupion. 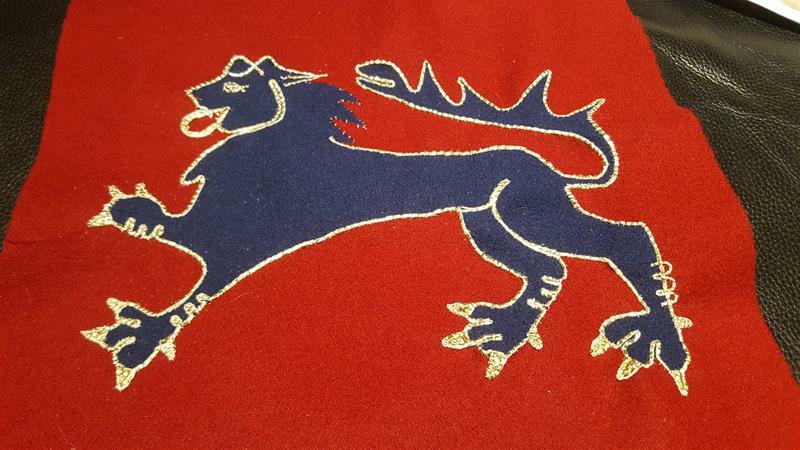 Below here you can find some pictures from the manufacturing and how it looked when Bertus wore the clothes at the battlefield as Valdemar Atterdag, the Danish king that invaded Gotland in 1361. Deciding if we should go with straight or curved – as the image. 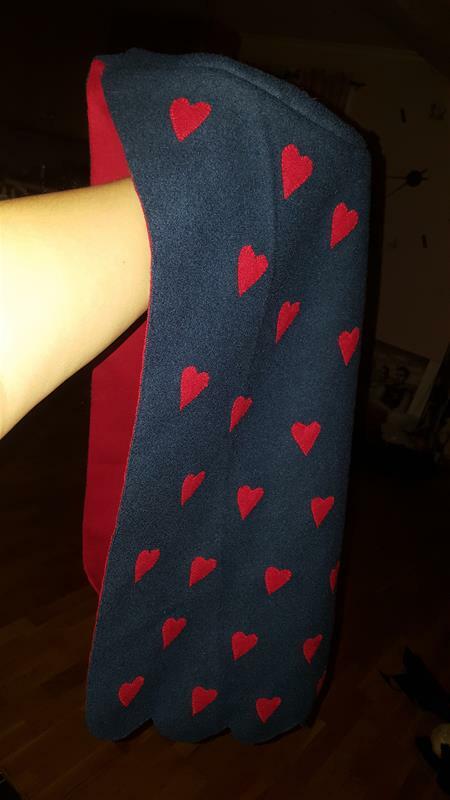 Trying out how many hearts we should fit on one sleeve. 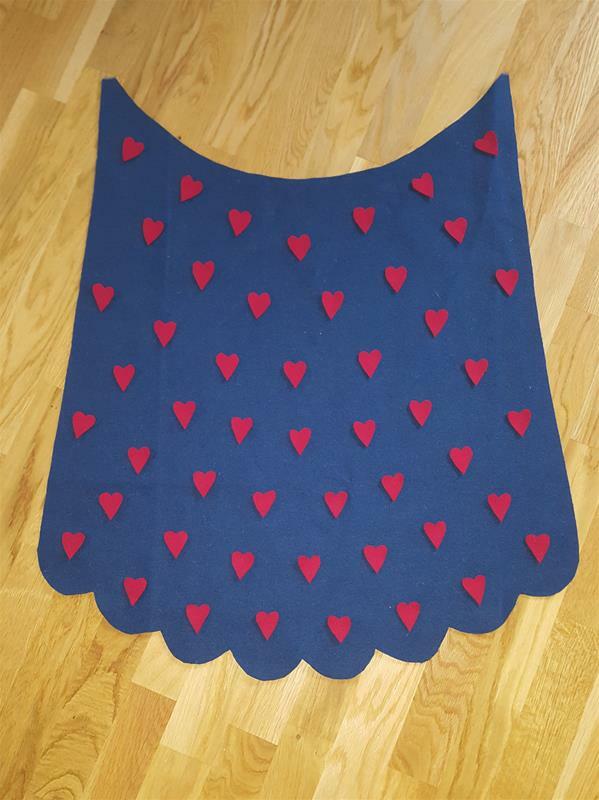 Last test before sewing all the hearts on. To sum up, this have been a collaborated effort. Bertus made the pattern with the help of Isis. Johan and Thomas participated with all of us to decide about details that would make or brake this. I might sound grim, but that is what my dear husband will be at Battle of Wisby this summer. Off course there won’t actually be any cannons, but it still is the correct term for those who is sent out to die in the battlefield. So, why will he be cannon fodder and not participate in the actual fighting? – eeeeh, well… maby it would be fun?! So I told him that he had to make his mind up as we needed to make some kind of armour for him in that case and it could be quite costly if we had to buy most of it. So he would think about it. Last year in October/November (after trying to find everything he needed to be a bowsman) I said that time was running out, would he like to be a bowsman, didn’t he want to participate at all or did he just want to be canon fodder? 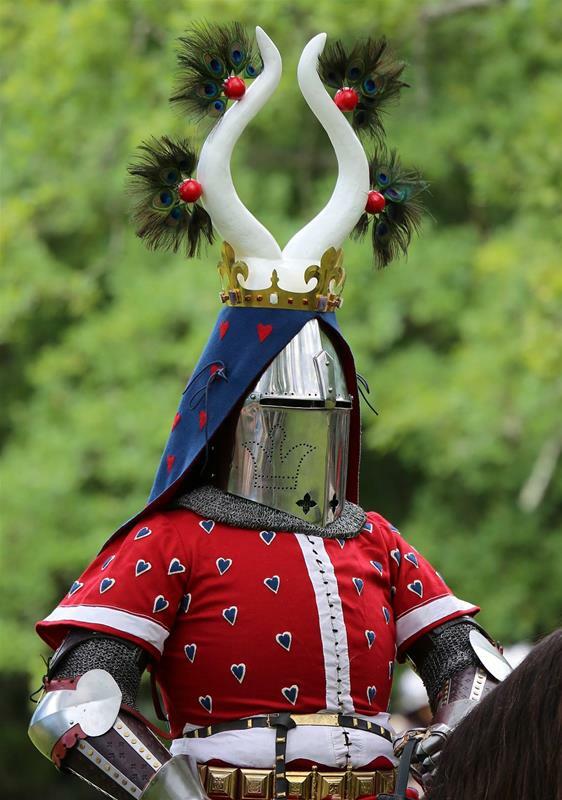 So for chrismas he got a secret helmet (cervellier) and a new kirtle and now he is quite engaged. 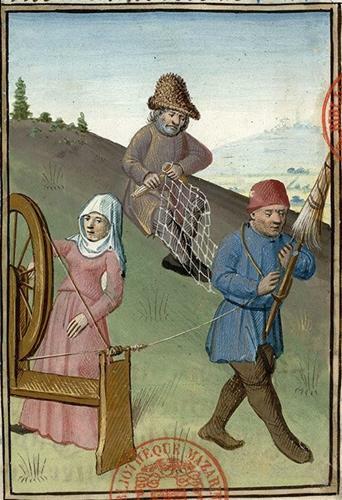 He is planning to practise “dyeing spectacularly” as soon as the snow is gone and the grass is dry. As both him and I have practised ju-jitsu, we know how to fall, and to fall BIG without hurting ourselves. 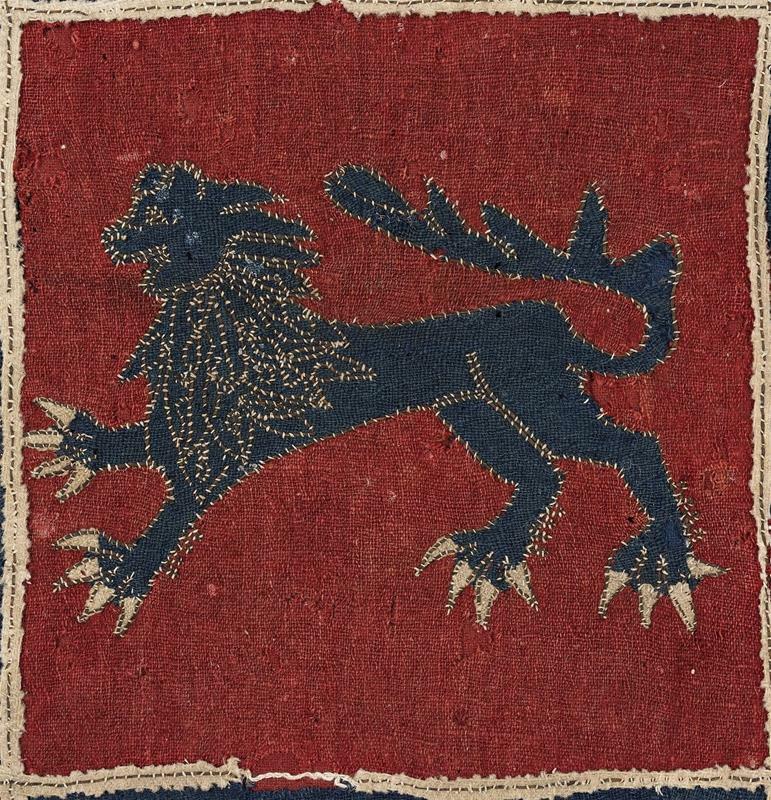 The thought is an arrow to the back while running (perhaps while delivering the message that the Danish is comeing, or running from the battlefield. But some more “deaths” will be rehersed to. I hope to se many more that like to participate as cannon fodder. If you sew your clothes as i show in the sew-alongs, you will be fine. If you don’t have correct shoes, you can sew a piece of leather to the sole of your hose. 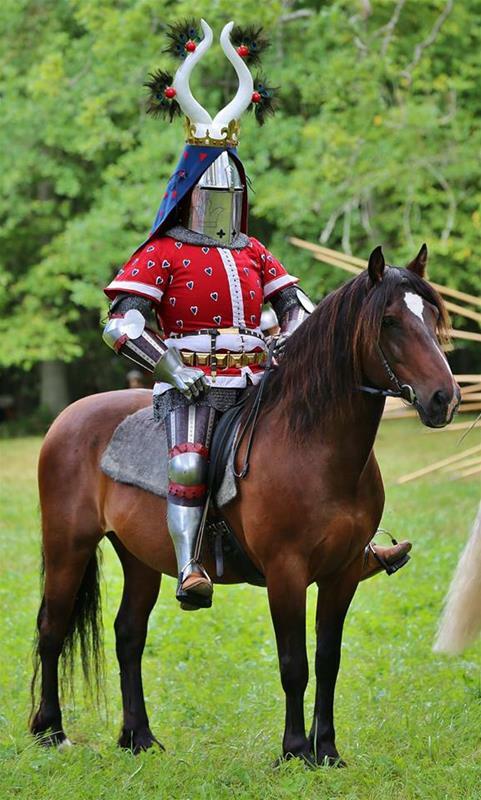 The only safety demand is that you have a helmet suitable for 1360 Sweden… We chose the secret as it doesn’t have a brim, so it is more comfortable after you “died” and lay on the ground, but the cettlehelmet is fine to. Join the official battle of wisby page and perhaps we can ask for special event/group for those who want to be cannon fodder. Ok det låter lite grymt, men det är precis vad min käre make kommer att vara på Battle of Wisby nu i sommar. Självklart kommer det inte finnas några riktiga kanoner på slagfältet, men termen kanonmat är ändå korrekt för de som sänds ut på slagfältet för att dö. Så, varför vill han vara kanonmat och inte delta i själva striden? – eeeh, tja, kanske det skulle vara kul? !Så jag sa åt honom att han måste bestämma sig eftersom vi måste fixa någon sorts rustning åt honom i så fall och det kan bli rätt kostsamt om vi måste köpa det mesta. Så han skulle fundera på det. Förra året i Oktober/November (efter att försökt hitta allt han behövde för att vara bågskytt) så sa jag att tiden för det rinner ut, ville han vara bågskytt, ville han inte delta alls eller ville han bara vara kanonmat? Så i julklapp fick han en secret hjälm (cervellier) och en ny kjortel och nu är han riktigt engagerad. Jag hoppas att många fler vill delta som kanonmat. 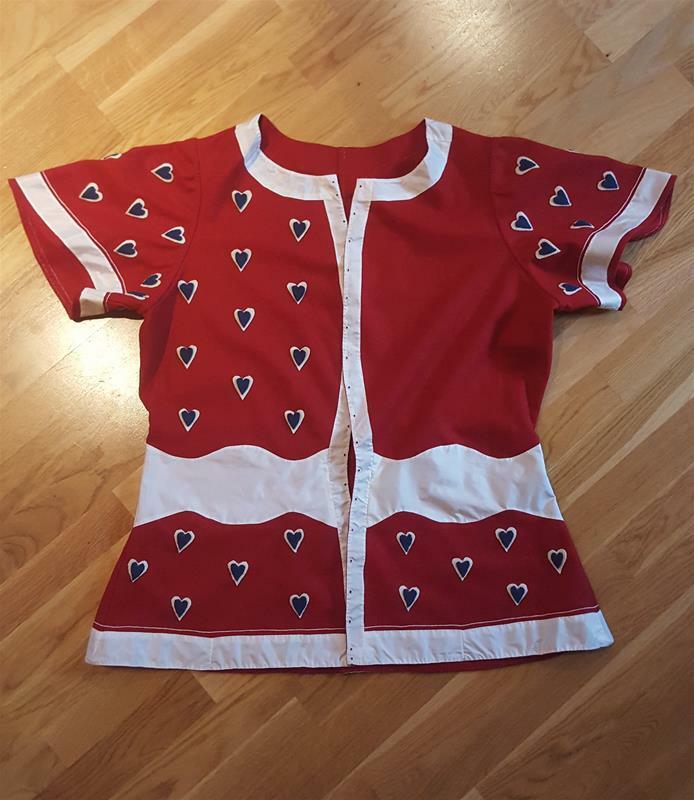 Om du syr dina kläder på sättet jag visar i mina sew-alongs så är du på rätt bana. Om du inte har korrekta skor så kan du sy på lädersulor på dina hosor. Det enda säkerhetskravet för kanonmat är att du har en hjälm som är passande för 1360-talets Sverige… Vi valde secrethjälmen eftersom den inte har något brätte och det kommer antagligen vara skönt när man har ”dött” och ligger ner på fältet, men kittelhjälmen funkar också. Gå med på The official battle of wisby -sidan så kanske vi kan be om ett speciellt event/grupp för dom som vill vara kanonmat. My dear husband, all geared up. Showing both the christmas presents (kirtle and helmet) and the hose from the last sew-along. Kära maken, i full utrustning. 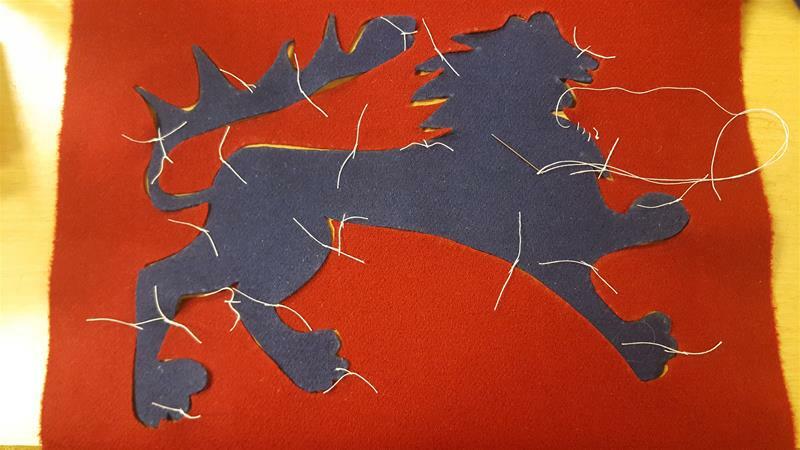 Här ser man både julklappskjorteln och hjälmen, samt hosorna från förra sew-alongen. 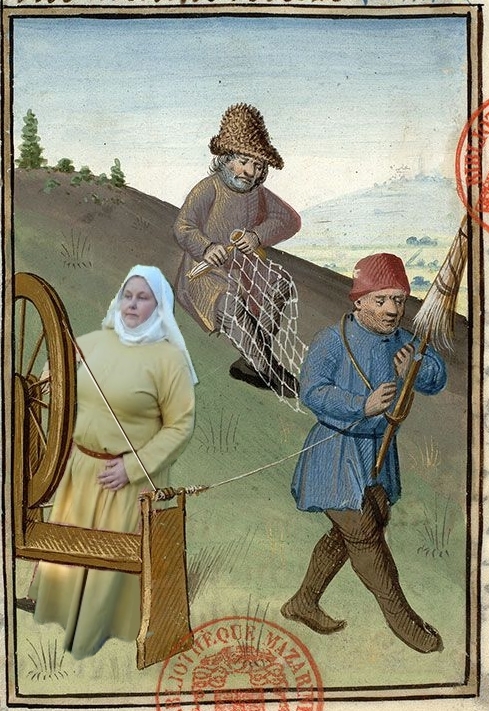 Just one kirtle? / Bara en kjortel? 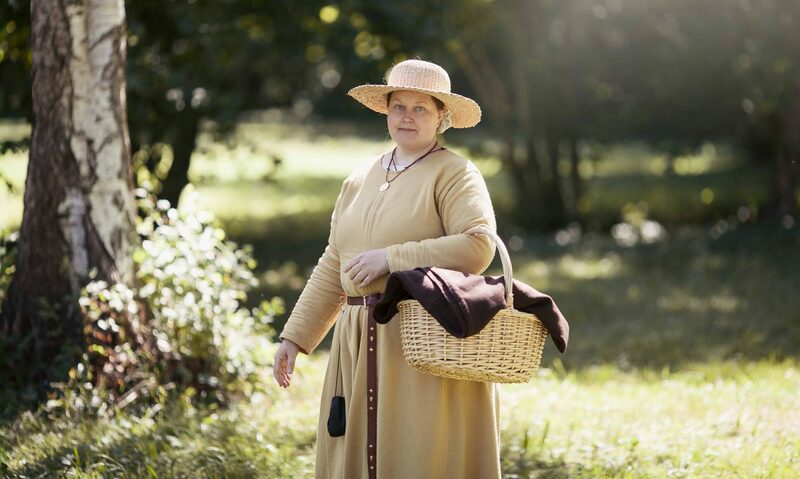 What would you say if I said that you can use the same kirtle no matter what period you recreate? At least between the viking age and to the end of the 15th century. Well, at least if you recreate a woman. For men it can be a little more difficult since the length of the kirtle changed trough the ages. But kneelength could be ok as long as you don’t attend a high demand event. Vad skulle du säga om jag sa att du kan använda samma kjortel oavsett vilken tidsepok du återskapar? Åtminstone mellan vikingatid och slutet av 1400-talet. Nåja, om du återskapar en kvinna så stämmer det i alla fall. För män kan det vara lite krångligare eftersom längden på kjorteln varierade mellan århundradena. Men knälängd kan funka så länge du inte besöker några högkravsevent i alla fall. Hur kan det här stämma? This is me as a viking. 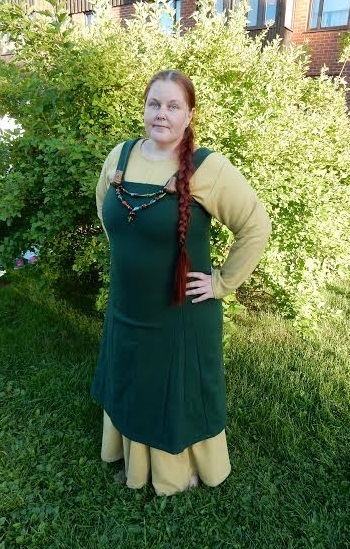 The green kirtle is borrowed, the yellow kirtle is sewn in the same way as the kirtle I sewn earlier in this blog. It is the yellow kirtle, sewn by ”square pieces and gussets-principal”, that you will see in all the pictures that follows. I just change accessories and hairstyle in the pictures. My friend who made this project with me, is Annie Rosén. When we met at Medieval week this year (2015) and started talking about this idea, we couldn’t let it go. 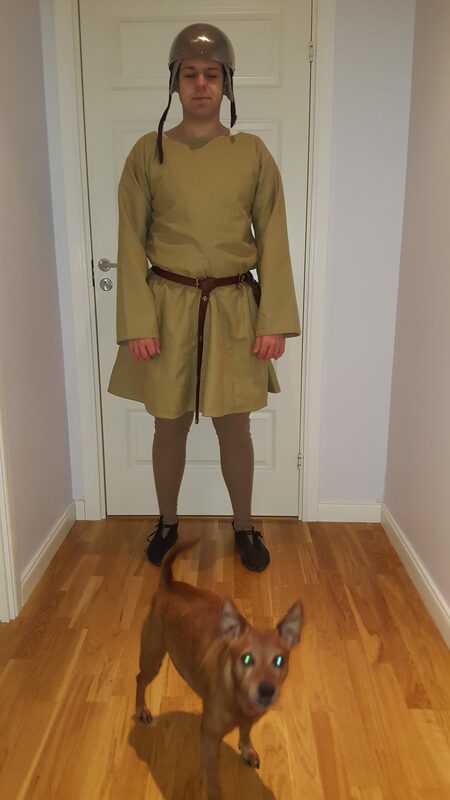 Det här är jag som viking. Den gröna kjorteln har jag lånat och den gula kjorteln är den som kommer finnas med på alla bilder i denna post. Den är sydd på samma sätt som kjorteln jag bloggade om tidigare här. Det vill säga med ”raka stycken och kilar-principen”. Det enda jag gör på följande bilder är att ändra frisyr och byta accessoarer. Min vän och kompanjon i detta projekt är Annie Rosén. När vi träffades på medeltidsveckan i år (2015) och kom in på den här idén så kunde vi inte släppa den. Ok my kirtle could have been a bit longer I don’t quite get that bulk at the belt (as you will notice on later pictures) but the style of the kirtle is spot on. Ok, min kjortel kunde ha varit en bra bit längre. Jag får liksom inte riktigt det där pöset vid bältet (som du även kommer märka i senare bilder) men stilen på kjorteln stämmer på pricken. 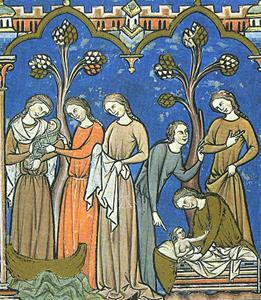 Next picture is dated to 1300-1325 and can be found in Breviary of Chertsey Abbey, England. 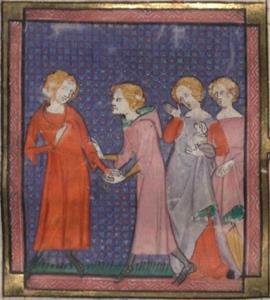 And now we move to France in 1340-1350 where we find this image in Roman en Prose de Lancelot du Lac. My wonderful dog is the best accessory but the dress still fits fine. Here under an sleeveles surcote. 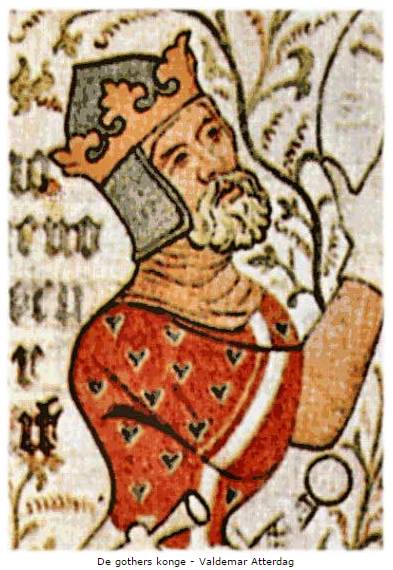 Vi förflyttar oss till 1340-1350 och Frankrike där vi hittar denna bild i Roman en Prose de Lancelot du Lac. Min underbara hund är den bästa accessoaren men klänningen funkar fortfarande. Här har jag även en ärmlös surcot över den. 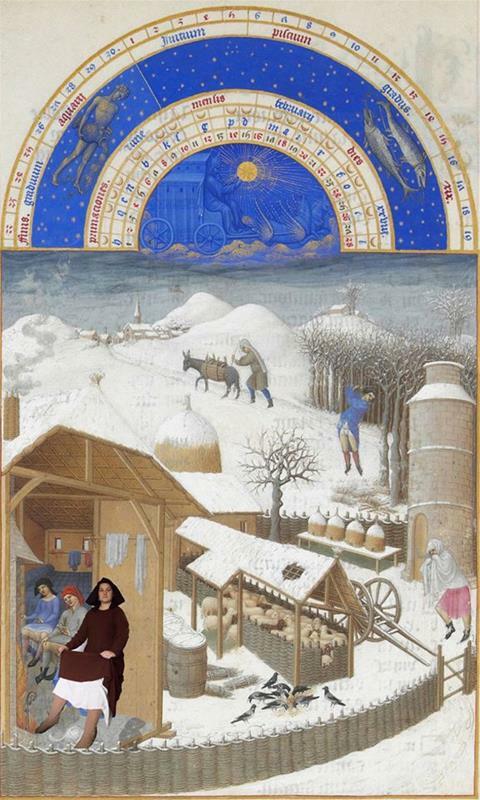 In Germany it could look like this in 1360. 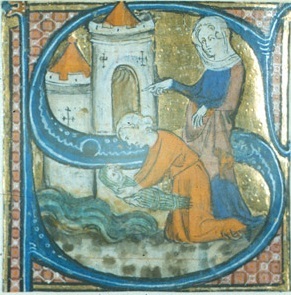 The manuscript is Speculum humanae salvationis. 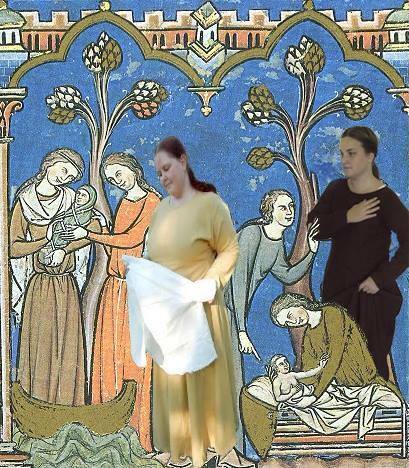 Året är 1360 och platsen är Tyskland, manuskriptet är Speculum humanae salvationis. And now for the last picture. 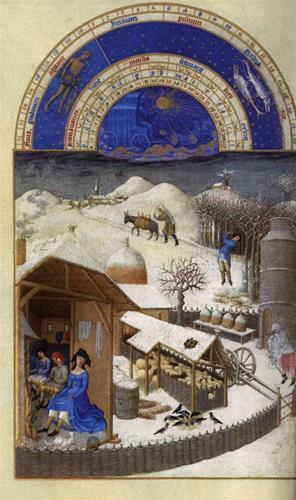 It is 1476 and the manuscriptis Livre de la chasse. 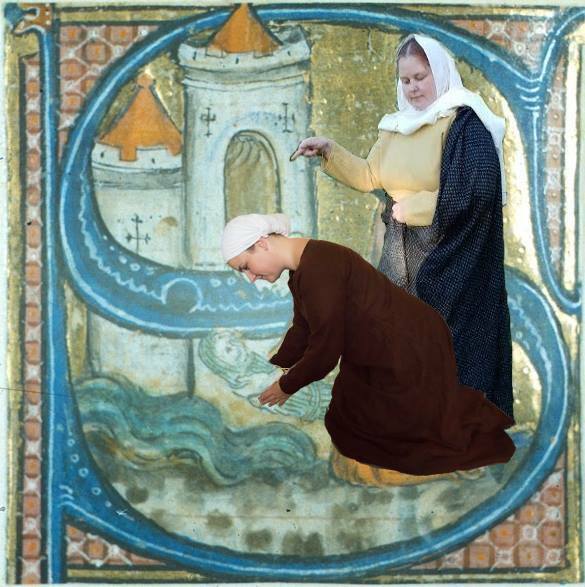 We could have found more pictures (there are so many to choose from where theese kind of kirtle is plausible) but we thought that you could try a bit on your own. Här har vi då sista bilden. 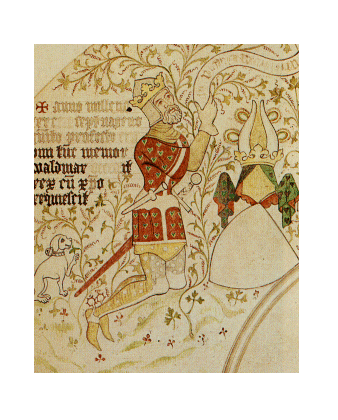 Året är 1476 och manuskriptet är Livre de la chasse.